Please do not attempt to interact with any terrorist account. This includes hacking. Hacking is best left for law enforcement and can land you in jail as any hacking is totally illegal. If anyone encourages you to hack, contact us or the FBI. This is a site where you can report links to ANY Social media Site where an online Terrorist is operating. 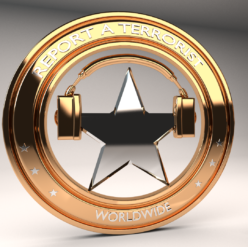 We are currently on Twitter under the handle @reportterrorist and can be contacted there as well as here. This is just t he start of our expanded operations. We currently have almost 49,000 ISIS/ Al-Qaeda/ Boko Haram / Al-Nussra accounts reported on Twitter. Our Facebook operations are kept confidential because of security concerns but you can report those accounts here.